A dazzlingly original account of the life and thought of Adam Smith, the greatest economist of all time. Adam Smith (1723–1790) is now widely regarded as the greatest economist of all time. But what he really thought, and the implications of his ideas, remain fiercely contested. Was he an eloquent advocate of capitalism and individual freedom? A prime mover of “market fundamentalism”? An apologist for human selfishness? Or something else entirely? 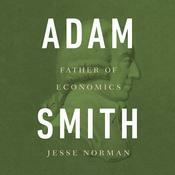 In Adam Smith, political philosopher Jesse Norman dispels the myths and caricatures, and provides a far more complex portrait of the man. Offering a highly engaging account of Smith’s life and times, Norman explores his work as a whole and traces his influence over two centuries to the present day. Finally, he shows how a proper understanding of Smith can help us address the problems of modern capitalism. The Smith who emerges from this audiobook is not only the greatest of all economists, but a pioneering theorist of moral philosophy, culture, and society. 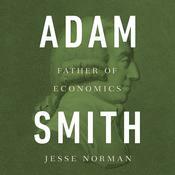 A dazzlingly original account of the life and thought of Adam Smith, the greatest economist of all time. Adam Smith (1723–1790) is now widely regarded as the greatest economist of all time. But what he really thought, and the implications of his ideas, remain fiercely contested. Was he an eloquent advocate of capitalism and individual freedom? A prime mover of “market fundamentalism”? An apologist for human selfishness? Or something else entirely? The Smith who emerges from this audiobook is not only the greatest of all economists, but a pioneering theorist of moral philosophy, culture, and society. Jesse Norman is widely regarded as one of the rising stars of the British House of Commons. As a member of parliament for Hereford and South Herefordshire, he was given the prestigious Parliamentarian of the Year award in 2012. Educated at Oxford University (BA) and University College London (MPhil, PhD), he has taught philosophy at University College London and is the author of several books and political works, including Compassionate Conservatism. He lives in Hereford and London.